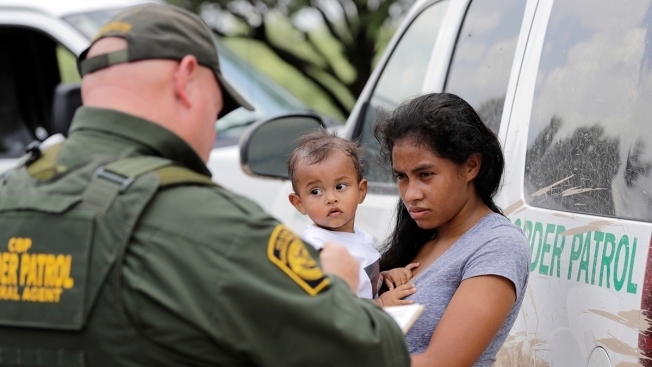 In this June 25, 2018, file photo, a mother migrating from Honduras holds her 1-year-old child as surrendering to U.S. Border Patrol agents after illegally crossing the border near McAllen, Texas. U.S. Customs and Border Protection data released Thursday shows that apprehensions of unauthorized people crossing the Southwest border were down in June, NBC News reported. The fiscal year-to-date total for people allegedly caught crossing without authorization is 286,290, officials said. The data also seem to call into question the Trump administration's warnings about a surge in Central American families at the border. The Trump administration argued that its relatively new zero tolerance policy on undocumented immigrants, which included the short-lived practice of separating children from their parents at the border, is dissuading them from coming north. Experts say, however, that the decline is not a direct result of the Trump administration's actions. They say numbers have been falling for years. "The long-term pattern is clear — fewer and fewer unauthorized migrants have been trying to enter the U.S. for more than 15 years — and it's mostly the product of larger macro-economic trends, not short-term changes in immigration policy or political rhetoric," Everard Meade, director of the University of San Diego's Trans-Border Institute, said.